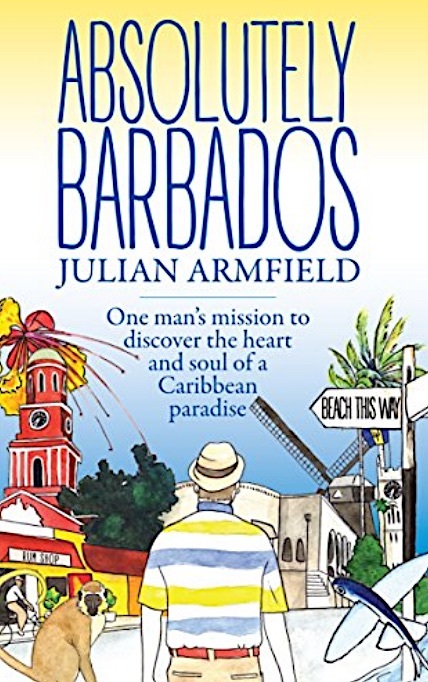 Julian Armfield, a veteran BBC broadcaster who chose to live in Barbados, has published a moving story of Barbados and its people, places and character. As he says, he was “on a mission to discover the heart and soul of a Caribbean Paradise”. He has done that with Absolutely Barbados, a book full of character and insights into a way of live that is absolutely unique. The book is a beautiful account of his adventure of discovering the soul of this Island Paradise. Absolutely Barbados is not your typical Travel Book. It is not just about the sights and sounds, food, attractions hotels, things to do and people to meet. It is a personal story of an adventure – packing up a life in an English village and the vast landscape of the United Kingdom, with its world-renowned theater, arts, museums, culture, heritage and towering architecture to move to a tiny island miles away, lost in a Caribbean Sea. Or so it may seem! As he says, the island was passed over by the Spanish and unlike other islands in the Caribbean, it was not fought over much, being a bit remote and not in the line of islands. He was invited to attend a lavish party by Bill Marshall, legendary race horse training and World War II hero, who had made Barbados his adopted home. The invitation led him to a voyage of discovery from which he “would never return”. “It’s Far Away,” he would think as he contemplated life sipping run punches under the coconut palms. But life here was about to surprise him in many ways. The book is about the discovery and the fascinating surprises and insights to a totally different way of life and a people who never cease to amaze. The book is a fun to read as Julian shares his adventures and insights with a light and witty style.